Using fabric to create one of kind gift tags, gift bags, note cards, and recipe cards is easy and even your children who are learning to iron can make these! Perfect for the holidays or even Mothers Day. I did this batch in early spring, but you can easily use holiday themed fabrics as well! I first learned this craft from an elderly lady. She taught me to make sets of notecards embellished with Cute fabric prints and give them away as gifts. I would make sets of 12 and then quickly started making gift tags and gift bags to match the cards and would give sets of them as a gift to my mother in law. My best friend makes sets of note cards for her mother in law all the time as she still loves to send notes in the regular mail, and loves the unique cards she makes for her. Jan's Tip: To make note cards, cut card stock in half along the long (11 inch side) fold in half. This size card will fit in the small invitation sized envelopes available at any office supply store. Following the directions on the fusible web, iron on the fusible web (paper side out, web side next to the fabric) to the under side of the fabric. Place the wrong side of the cut out onto the desired location on your note cards, gift tags etc. Using iron set to med. 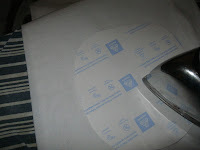 heat, (use directions on the fusible webbing package) iron over the cut out till it has stuck to the paper. Embellish the notecard/gift tag/bag as desired. Wonderful post,. I like it, Thanks for sharing.